At In2Eyes our goal is to understand your condition. The Comprehensive Dry Eye Assessment enables us to find the causes of your dry eyes and to produce a digital recordwhich we can use to show you the extent of the problem. We can then take further readings after treatment to show you the changes which have occurred. Different diseases require different treatment. That is why, at In2Eyes, we create your Dry Eye Treatment Action Plan which is tailored to you. In some cases, the solution may be simple, while in others, you may require ongoing treatment. In any case, our goal is to always provide you with optimal care and relief from your symptomsof dry eyes. We personalize the treatment plan depending upon the source of the problem. Some cases require special treatment which can be done in house. Meibomian Gland Dysfunction will usually require gland expression (MGE) while Blepharitis can be treated with Blephex™ eyelid scrub. MGD affects 86% with Dry Eye and it’s treatable. In2Eyes is one of the few practices in Melbourne who provide IPL treatment as well as Lipiflow for evaporative dry eye eyes caused by MGD. 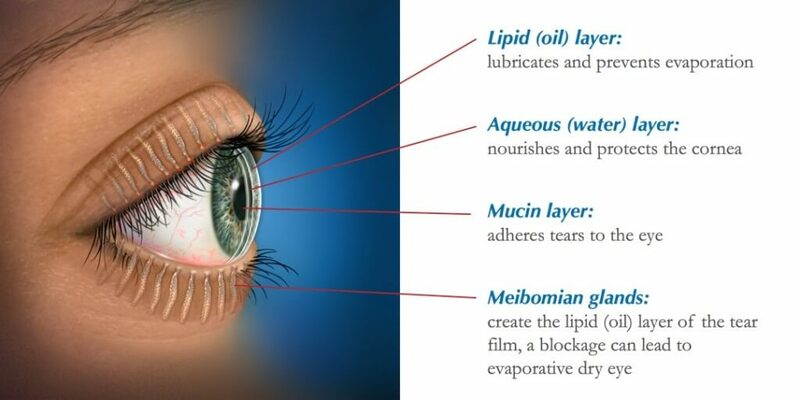 MGD occurs when blockages in the Meibomian glands inhibit the natural production of protective oils which combine with the watery layer in our tear film to reduce evaporation. These oils are essential in preventing dry eye and, without them, our eyes become more prone to the symptoms of dry eye syndrome through prolonged computer use, reading, dry climates, air conditioning or other environments and activities which result in the evaporation of the tear film or reduced blinking. Some cases of Dry Eye Syndrome require treatment beyond standard heat therapy. IPL (Intense Pulsed Light) therapy generates a polychromatic pulsed light by producing perfectly calibrated and homogenously sequenced light pulses. The energy, spectrum, and time period are precisely set to stimulate the Meibomian glands in order for them to return their normal function. Stimulation with IPL leads to the Meibomian glands returning to their normal function in a very short time and you may feel the benefits within just a couple of hours following treatment. The decision to begin treatment with IPL will be discussed with your optometrist during your comprehensive dry eye assessment. Typically, IPL treatment requires several sessions and will be tailored to your requirements depending on the severity of your dry eye syndrome. For optimum results, three sessions are usually recommended. The positive effects of IPL treatment are cumulative. Improvement in Meibomian gland function after treatment with IPL will last for about a week after the initial treatment, two to three weeks after the second treatment, then from a two months onward. In many cases many patients report relief from symptoms on the day of treatment. We will also provide you with appropriate at home treatment and ongoing lifestyle recommendationswhich should improve your overall eye health and reduce symptoms of Dry Eyes. In2Eyes is one of the few optometry clinics offering LipiFlow® for dry eye treatment caused by Meibomian Gland Dysfunction. 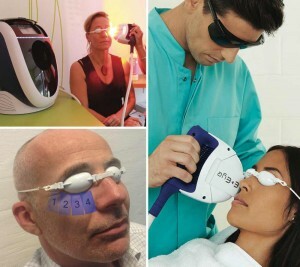 LipiFlow® is a relatively new technology which is designed to treat the root cause of Evaporative Dry Eye Syndrome. This advanced procedure treats the Meibomian Gland blockage directly by applying warm energy to the eyelid near the affected glands. The precise targeting of of these glands with vectored thermal pulsation (VTP) technology, and controlled, intermittent massage is performed in the consultation room by your optometrist. Individually sealed devices called activators are placed around the eyelids. A gentle “massaging” coupled with the precise delivery of heat is applied removing gland blockages and reactivating gland function. The treatment is designed so the eyeball is completely protected. The effects of LipiFlow depend on the health of your gland structure and the extent of your MGD. Thus, results may vary with each patient. Some patients may notice results within weeks, while for others, it may take up to 90 days to notice results as the glands naturally begin to generate and expel necessary oil levels needed to properly protect the tear film. LipiFlow® may be recommended as part of your Dry Eye Treatment Action Plan: please speak to your optometrist during your comprehensive dry eye assessment to find out if LipiFlow® is right for you. 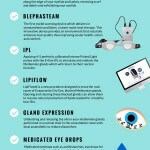 Click on the below infographic to see how we help you manage your dry eyes at In2Eyes Optometry. Feel free to download the image and share it with your friends and family. Blephasteam: The Blephasteam® device is convenient, safe, and allows clear vision during use, allowing you to carry out normal task activities such as reading, watching television or playing on your smartphone. We administer Blephasteam treatment in our Surrey Hills Clinic for Dry Eyes patients. Blephadex products are highly effective for managing blepharitis and symptoms associated with dry eye. By eliminating bacteria on the lids, Blephadex wipes and scrubs ensure the eyes do not become irritated. As part of our dry eye treatment at our Surrey Hills clinic, we offer aftercare in the form of Blephadex wipes and scrubs. If you have been looking to manage your dry eyes, Surrey Hills’ In2Eyes can help. We are proud to offer Blephadex to Melbourne locals looking to maintain hygienic, bacteria-free eyelids for their overall eye health. Visit our clinic today or call us to find out how Blephadex products can help you. Disclaimer: This article is for information only and should not be used for the diagnosis or treatment of medical conditions. In2Eyes has used all reasonable care in compiling the information but make no warranty as to its accuracy. Please consult our optometrists, or other health care professional for diagnosis and treatment of medical conditions.